Annotation Mode in Workbook / AlphaTeach is also known as “Glass Mode”. Here’s where you can use your favourite Workbook pens or other tools right over any software or document in your computer. This is a great way to extend the power of Workbook to any other tools on your computer. Mark up documents; draw on images, maps and charts; use the magnifier or the spotlight to focus viewer attention on part of your screen…. It can all be done using Annotation Mode. Workbook’s “glass mode” (or “annotation mode”) provides the freedom to use all of your Workbook tools, to annotate and draw over any of your software. Mock up web pages, documents, brochures, designs in an instant – and get the detail design work done outside of the team sessions. When you press the “Glass Mode” button, Workbook’s canvas minimises to your tray and a “floating toolbar” appears with all your favorite Workbook pens and tools. This floats over your desktop, your browser, maps, or any software you are displaying on your screen. One press of a button and you can draw ink, type text, use a spotlight or ruler or other tools – right over the top of the displayed content. 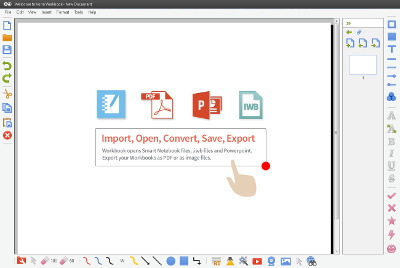 Press the camera tool to save a snapshot of the screen into your minimised Workbook, or drag to select the desired capture area. 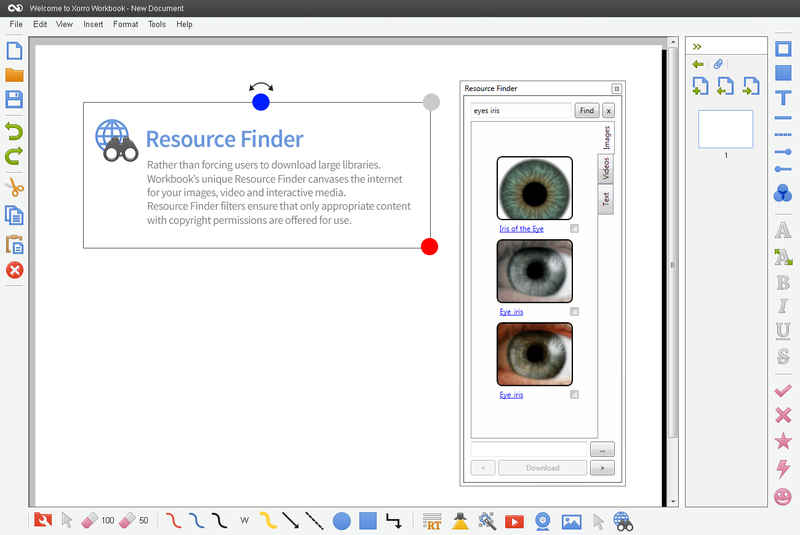 Xorro Workbook’s Glass Mode lets you annotate with any tool, over any displayed content. Xorro-ED is a free resource-sharing community for all educators. Workbook integrates with Xorro-ED, so you can search for and share interactive whiteboard activities, presentations instantly. Resources are ranked for usefulness. Optimised filtering ensures your searches yield the most relevant resources. Join the Xorro-ED community – free. Workbook is designed to help you build lessons instantly, and to facilitate the classroom learning experience. Just like your conventional whiteboard, you can use pens to write in ink… only now you’re writing in digital ink, and its being stored in your computer. You’ll set up your favourite pens (they never run out of ink!) and your favourite tools. Workbook’s page extender and page sorter means you’ll never run out of whiteboard space. Everything is instantly scaled, rotated, moved on the page or between pages. That’s where it all starts…. Searching for, finding and sharing Workbook files is made really easy through your free membership in the Xorro-ED community. Become a “sharer” and you’ll find it really easy to post your workbooks to the community. You’ll win recognition from other educators on the community for each post. Then, when you’re looking for workbooks to give you a head-start on your next project, you’ll discover that your peers have already ranked the most useful ones for your search criteria! Join Xorro-ED (membership is free). If you need to work with larger audiences, or you need to ask loads of questions, then the Free Facilitator access won’t be enough for you. Xorro offers plenty of options: You can buy a Facilitator Plan appropriate to the size of your largest audience, or you can remain a Free facilitator but ask your participants to contribute through a Participant Access Fee. Four plans, Q30, Q100, Q300 and Q1k apply to audiences of up to 30, 100, 300 or 1000 respectively (there is a 10% tolerance on these numbers so the plans do “stretch”). Facilitator Plans are held by your Institution account, and can be assigned flexibly whenever you want among the institution’s facilitators. The assignment only takes a moment for a nominated “Institution Manager”. It is common for an institution to buy a few plans associated with the volumes they expect to encounter through a year. These plans are then assigned for short periods of time to those facilitators who will need them. Facilitators not assigned a Facilitator plan will automatically be “Free Facilitators”, so they will continue to have full functionality in Xorro-Q but restraints on activity volumes will apply. Read more: Facilitator Plans ▪ Xorro-Q Licensing and Pricing Explained ▪ Assigning Plans to Users ▪ Who are the Institution Managers at my organisation? If you need more than the Free Facilitator plan can offer but your budget won’t support our Facilitator Plans, you can alternatively ask your participants to contribute through a Participant Access Fee. Fee paying participants are exempt from the counts used in our facilitator plans, so you can have an unlimited audience size for the very low price of a Q30 plan. This makes Participant Access Fees a very economical and flexible way to supplement your low-cost facilitator plan, or even a Free Facilitator plan (be aware though that for the latter the monthly question limit will still apply). Facilitators can set a Participant Access Fee for any group of participants. When the participant clicks a link to any activity associated with that group, they will need to join the group by paying the Access Fee. The participant will receive a “Participant Plus” account permitting year-long access to those groups you have associated with the Fee. A minimum fee of US$4.94 per participant per year applies, however you can apply a premium charge eg to cover unique content fees or other course fees; in this case the premium less a small management share is credited to you (the facilitator). In Xorro, a Free Facilitator has unrestricted access to all functionality for creating activities, viewing reports etc. Within institutions, Free Facilitators can share activities, access participant groups etc with full privileges. If you and/or your colleagues occasionally use Xorro-Q with small groups or classes, then the Free Facilitator plan is all you will need. Free facilitators can run activities with groups of up to 33 free participants, so in this respect it is similar to the (paid) Q30 plan. However, a Free facilitator can “ask” no more than 100 questions per month in total. For example, they could ask 100 questions once of one group of 30 participants, or they could ask four groups of 30 participants 25 questions each, or they might ask 5 questions of 20 different groups (of up to 30 participants each) over the course of the month. There’s nothing like some friendly competition to get your group focused on the questions at hand. Xorro-Q’s Leaderboard can be displayed when and where you want it. Updating after every question, Leaderboard reports the best scores as well as the fastest correct player. Leaderboard can be used to recognise individuals, or to motivate teams. Over time, your store of useful questions will grow. Xoro’s Q-Bank makes it easy for you to manage these questions purposefully. 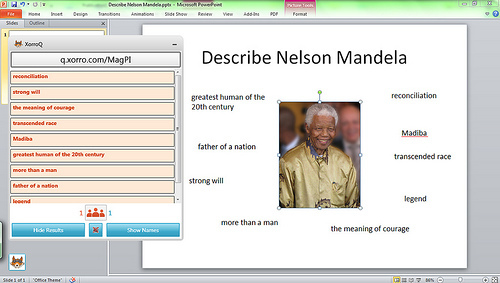 Categorisation and tagging allows groups of questions to be accessed randomly by activities. You can also choose to share your questions with others, and search for questions on topics or tags of your choice. In live activities, it’s essential that you know how your audience is progressing with answering the question. Xorro-Q’s participation dashboard provides a head-up instant display of progress, even when the question is “minimised”. Floating dashboards can be dragged to display on the screen of your choice. Designed to achieve full participation from the largest of audiences, the participation dashboard can be configured to make non-participation uncomfortable, without ever making a participant feel unsafe or at risk. Attendance and engagement are core eporting outcomes from Xorro-Q, and can be explored per participant, per activity, per facilitator, or even across your entire institution. Institution-wide metrics provide remarkable insights into which participants (or students) are not engaged in which courses; which facilitators achieve higher levels of audience engagement; which content receives most engagement. Key metrics can be integrated to your LMS )Learning Management System) through LTI connectivity. All question types can be flexibly assessed. Because Xorro-Q requires no downloads, no plug-ins and no time at all to start using, you’ll get maximum participation from your audience. Xorro-Q’s desktop Q-Launcher makes Q the perfect complement to a slide show or video, or any other software being used during the session. The Q-Launcher toolbar floats over your display context (such as a slide show or video etc), so you can ask an “instant” question (or one you’ve prepared ahead of time) at exactly the right time…. It’s easy to organise participants into groups and to ensure access to your activities is limited to group members. (If you are using an LMS, Xorro-Q can acquire this data automatically from the LMS). You can even apply different access fees to groups. Every Facilitator has a unique URL at which participants will reach activities being run by that facilitator. This makes it easier than ever to get people to your activities – and to manage and update them too: especially if you use permalinks. Would you like a customised URL such as q.xorro.com/YOUR_NAME or some variation on this? Contact us if you want your Access URL to be customised. If you want to be able to make changes to an activity after launching it, you’ll love permalinks. These provide a way of publishing your activities, and then later releasing new versions to the same published permalink. Xorro-Q’s practice mode enables participants to repeat activities as many times as necessary to achieve a desired outcome. Facilitators can enable activities to be repeated, and if required can also choose whether to record the first, or the best score from the multiple attempts (all raw data is of course preserved as well). Set a required minimum achievement level, and watch Xorro-Q’s automated feedback motivate students to attain this. “Rehearse” is also the brand attached to Xorro’s practice-based engineering concept activities. By experiencing a wide range of different problems and attempting these without any risk, students acquire confidence and familiarity with the fundamentals – so they’ll be ready to focus on more advanced ideas in class! 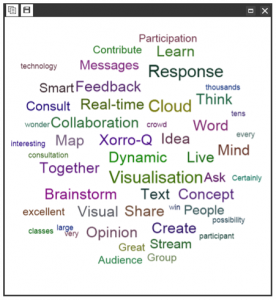 Generating instant wordcloud views from your audience’s text responses is a great way of expressing your audience’s ideas and views succinctly and powerfully. Wordclouds can be displayed “live” as contributions come in, or they can be presented for discussion after a question is closed. Key data for each activity including attendance, participation reports, students at risk and of course scores, are all instantly available and exportable. Key outcomes can also be automatically transferred to your LMS via Xorro-Q’s LTI interface. Ask Instant Questions - instantly! With one press of a button on your floating toolbar you can “ask” your audience a question right from your slideshow, or from within a video or another application. Your screen context will be saved along with the responses. Results can be viewed as they come in, or when you “close” the question to further responses. We have designed Workbook to be highly customisable. We know that every user’s situation is different, so why expect a senior year Maths teacher to use the same tools as a primary school teacher, or a university lecturer to use the same tools as a call centre manager? Workbook provides tools for a great many purposes; only a few of these will be needed by most users. 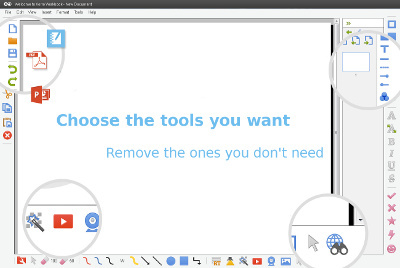 That’s why you can choose and organise selected tools in custom toolbars. Your custom toolbars can also provide one-click links to folders anywhere on your network, so you can instantly find and drag text, image and media resources to your Workbook canvas just when you need to. Custom toolbars can be positioned to suit your needs as well, and they can be shared with your colleagues. In this way, your Workbook remains free of clutter and visual distractions, and achieves the simplicity and ease of use for which we are well known. Workbook is designed with your flexibility of use in mind. We realise that you want to be able to use Workbook with any interactive device, not just those from a particular vendor. Your license permits this, so you are free to choose your software separately from your hardware. 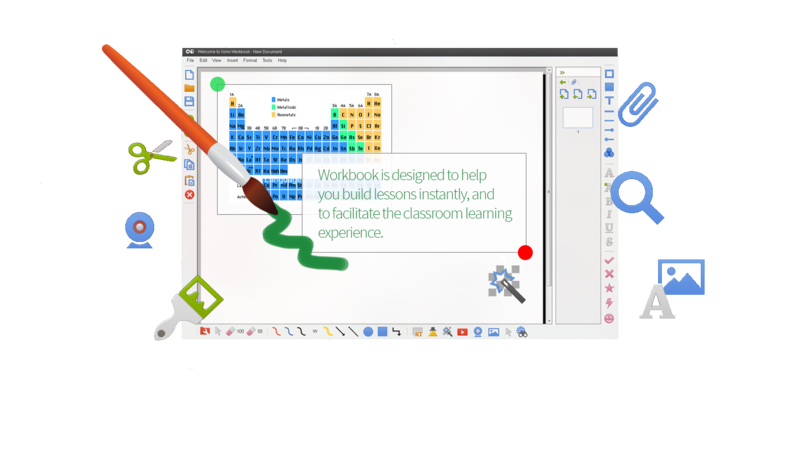 Because many whiteboarders have used competing tools such as SMART Notebook in the past, Workbook allows files created using these tools to be opened, edited and shared. So – if you’re looking for smartboard software (but not necessarily for use only with a smartboard) then you need look no further! Similarly, the “.iwb” file extension is also supported so you can access resources created by educators using other interactive whiteboard manufacturers. Xorro-Q integration means that your audience will be participating in your Workbook activities using their cellphones, tablets, laptops etc – in fact, any device with an internet connection. Using Workbook’s custom Q-Launchers, you can launch questions straight from your page. Participants’ replies can be dragged onto your page, or to other software (eg for brainstorming). Votes are tallied and scored automatically. Xorro-Q’s simple dashboard allows you to control what’s on show, see who has or hasn’t responded, and even “mute” inappropriate responders! Workbook’s live video and web feeds let you display, annotate, record and capture from multiple web cam (or other camera) feeds right on the canvas. Great for those Science experiments, drama, student presentations! Whether it’s a live camera feed, a webcam, a YouTube clip or a saved video from your network: you’ll be annotating and capturing snaps in no time at all. You’ll love Workbook’s integrated concept-mapping which lets you instantly build mind-maps and structured diagrams on-the-fly. 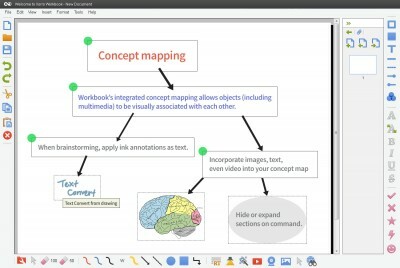 Workbook’s connectors hook together text, shapes, images and media into structured diagrams which can be collapsed or expanded at will. Add links and “jumps”, web content etc to develop your concept maps from 2D visual views, into complete interactive guides. We all know the resources are out there on the web, but how can you find and filter them easily when you need to? Workbook’s Resource Finder lets you instantly find appropriate image and video resources on the web, and drag these to your Workbook canvas. Finder takes care of the copyright filtering and appropriateness checks for you. Save loads of time and become confident in your in-class inquiry searches! For most requirements involving groups of 30 people or so, the Free facilitator plan provides everything that’s needed. Choose a facilitator plan from three available (Q30, Q300, Q3k). Ask your participants to pay to pay a one-time access fee to join your group in Xorro-Q. Heatmaps dynamically display how your audience interacts with your hotspot image questions. Heatmaps colour code to indicate the density of selection in zones on the image. If you choose to pre-define zones as “correct” or “incorrect” then the colour coding will display shades of green (correct) and yellow-through-red (for incorrect) depending on the density of selection. Excellent targeted feedback is the key to any learning system. Xorro-Q supports very granular feedback which is sensitive to specific responses in all question types. Feedback can include go-to links and hyperlinks for review or instruction purposes. Facilitators can choose when and how to deliver feedback to Participants: Xorro-Q enables feedback after every question attempt, or at the end of an activity, or both, or neither!